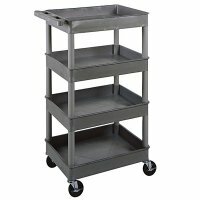 Small four tub shelf utility cart with 4" casters, two with locking brake. Made of heavy duty molded plastic. Four 2 3/4" deep tub shelves. Shelf clearance 8 3/4". Top shelf is reinforced with one aluminum bar. 300lb maximum weight capacity. Easy assembly with rubber mallet (included). Lifetime warranty.